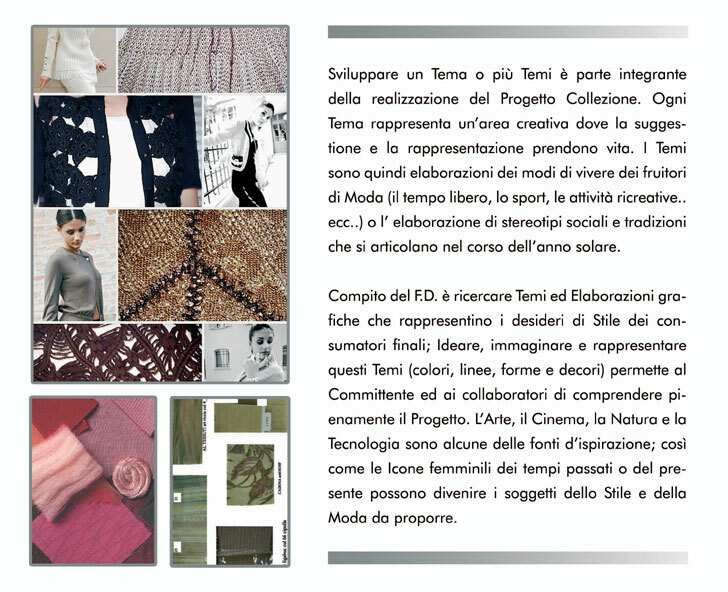 Develop a theme or themes is an integral part of the implementation of the Project Collection. Each theme raprrresenta a creative area where suggessione and representation come to life. The themes are then processing of the ways of life of the users of Fashion (leisure, sport, leisure activities .. etc ..) or the development of social traditions and stereotypes that are articulated in the calendar year. F.D the task is to research themes and graphics that represent the final consumers of style you want, create, imagine and represent these themes (colors, lines, shapes and decorations) to the client and allows employees to fully understand the project. Art, Cinema, Nature and Technology are some of the sources of inspiration, as well as the female icons of yesteryear or this may become the subject of Style and Fashion to propose.